Everyone needs a little break from time to time, Enduro Croatia has prepared fantastic new routes for every level of difficulty, from beginner to professional. Crossing various landscape forms, from green pastures, green hills, rivers, mountains with alpine vegetation and rocky peaks to muddy canyons, every enduro rider has the opportunity to prove his skill and drive in areas of varying degrees of difficulty. Whether beginner or experienced Enduro rider, our nature offers you the perfect track for an incredible off-road adventure. With us you take things into your own hands, with stops at some of the many breathtaking places on the Istrian peninsula. Awaken your wild side and get to know our beautiful central Istria from a different perspective – rich in history and interesting secrets. All houses are located in central Istria and all have direct access to off-road routes! 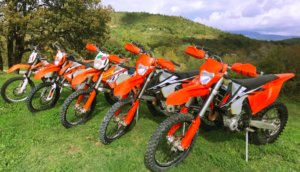 Discover the hospitality of Enduro Croatia, taste traditional Croatian cuisine and admire the beautiful Istrian region by booking a guided enduro tour offered by Enduro Croatia.